April is National Poetry Month and I love reading poetry. I also love writing poetry. Nothing speaks to the soul quite like this literary medium. Resting heavily on description and metaphors, you can convey a million feelings just with one word or a few, but the art form is much more multifaceted than that. If you have never cracked open a poetry book before, here are some I recommend. If you have, here are some you may not have read. So, celebrate spring by reading some poetry with a cup of tea in nature or in a quiet room. You can also let life or nature take you on a journey by writing some of your own. 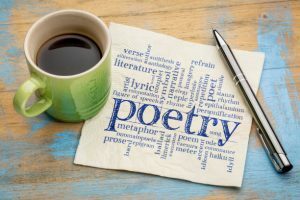 Poetry comes in so many forms including sonnets, haikus, rhyming, lyrical, prose, epic, couplet, ode, ballad, limerick and free verse to name a few. Come explore the St. Tammany Parish Library for some poetry to celebrate this April.